Anyone who knows me knows that I get a little crazy around Halloween, especially when it comes to pumpkins. Years ago I saw what you can do and began breaking my back creating elaborate pumpkins for my myself and my family. Eventually I started realizing that carving a ridiculously hard design on a real pumpkin is devastatingly hard work and depressing since pumpkins in Hawaii rot in about a day or two. Eventually I started doing foam pumpkins for the special designs, but I do still carve real pumpkins for the kids. This Halloween, I’ve made some Ender’s Game pumpkin stencils for you guys to download and try out. 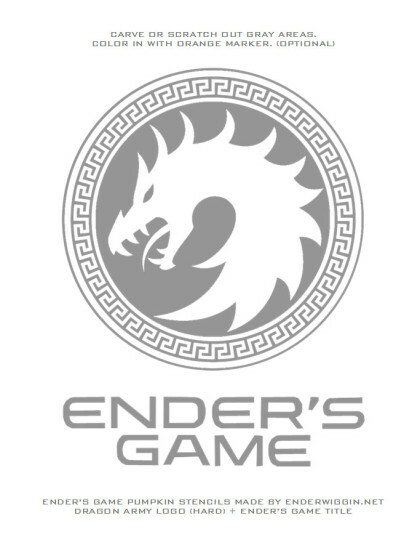 Later this week I will be releasing the full details for the October 31st Countdown to NovEnder contest, which will of course be my favorite type of contest all year: an Ender’s Game Pumpkin Carving Contest! Here’s a sample of what they look like! If you make one before I announce the full rules, make sure to take photos and proof photos (so I know you made it yourself).